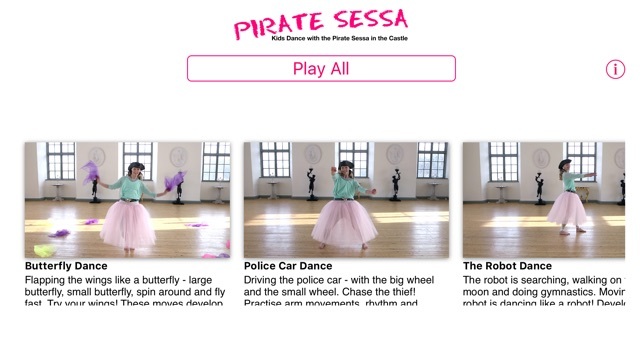 10 kids dance videos where you get to hang out with the Pirate Sessa in her mother’s castle – to dance and just have fun. As an adult you can say the dance titles the first few times, ”this is the butterfly dance” for example. Each dance video has a theme that the child can relate to – with simple moves so that the child can just follow along. The dances in ”Pirate Sessa in the Castle” are inspired by the butterfly, police car, robot, airplane, horse, tiger, frog, scissors and bear. Video and music for each track.